For weeks now, we’ve been forced to use our feeble imaginations to picture how Paul Thomas Anderson might go about translating Thomas Pynchon’s Inherent Vice to the screen, only to become immediately distracted by our imagination coming up with more things Taco Bell could make into tacos. (No, imagination—no one wants a Frittatataco! Attractive alliteration or not, frittatas make impractical taco shells!) 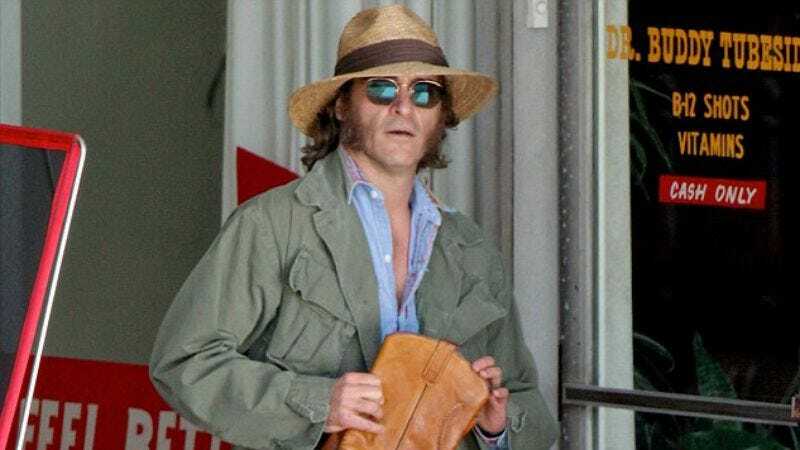 Fortunately, filming has begun and therefore the paparazzi are already on set, so thanks to The Daily Mail, we can now get our first actual look at how Anderson will transform Joaquin Phoenix into his early-‘70s-era stoner detective, Doc Sportello: by using a hat and some muttonchops.